Sanjay Gupta is the Eli and Edythe L. Broad Dean of the Eli Broad College of Business. He joined the Broad College in 2007 as the Russell E. Palmer Endowed Professor of Accounting and chair of the Department of Accounting and Information Systems. He was appointed associate dean for the MBA and professional master's programs in July 2012. 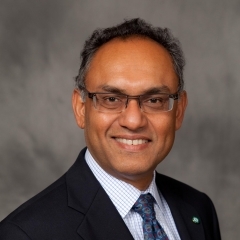 As associate dean, Gupta instituted curricular innovations, such as BroadWeeks, in the Full-Time MBA program, led a task force to evaluate the Weekend MBA program, and facilitated the launch of new master's programs in business analytics and management, strategy, and leadership. Average GMAT scores of entering students rose by 25 points during his tenure, and the MBA program increased its position in global and national rankings. Previously, he held several positions in the W. P. Carey School of Business at Arizona State University, including the first Henry & Horne Professorship in Accountancy, Dean's Council of 100 Distinguished Scholars, and faculty director of the master of accountancy and information systems and the master of taxation programs. He has been recognized by the Broad College's Executive MBA Class of 2010 with the Faculty Excellence Award and by the Arizona Society of CPAs with the Accounting Education Innovation Award and the Outstanding Educator Award. He was chosen by MSU for the Committee on Institutional Cooperation's (CIC) Academic Leaders Program and the CIC's Department Executive Officers' Seminar. Gupta's research focuses on corporate and individual tax policy issues. He has written extensively on corporate tax burdens, corporate responses to changes in tax incentives, and the interaction of taxes and financial reporting. He has published in leading tax and accounting journals including the National Tax Journal, the Journal of the American Taxation Association, the Accounting Review, the Journal of Accounting and Economics, the Journal of Law and Economics, and Tax Notes. His research on the political economy of corporate taxation and state corporate tax issues has been cited in the media, in court cases, and at public policy forums. Based on downloads and citations of his research, he ranks in the top two percent of all authors in the Social Science Research Network (SSRN). He is currently an expert witness for a state department of revenue. He has consulted for the Big Four public accounting firms, the U.S. government (Bureau of Economic Affairs and Internal Revenue Service), international consulting firms (Charles River Associates and Equity Methods), and Fortune 500 companies (Motorola and Sempra Energy). He serves on the University of Notre Dame Accounting Advisory Board and the MSU-CIBER Advisory Board. He has also served various business schools as part of their AACSB Accreditation Review Teams. Gupta received his Ph.D. from Michigan State University, a master of accountancy from Bowling Green State University, a bachelor of laws from Calcutta University in India, and a bachelor of commerce from the University of Mumbai. He holds non-practicing certifications as a CPA and a member of the Institute of Company Secretaries of India. Sanjay Gupta, Lillian Mills, Erin Towery (2014). “The Effect of Mandatory Financial Statement Disclosures of Tax Uncertainty on Tax Reporting and Collections: The Case of FIN 48 and Multistate Tax Avoidance,” The Journal of the American Taxation Association.36(2), Fall, pp. 203-229. Winner of 2015 Journal of American Taxation Association Outstanding Paper Award. Ming-Chin Chen and Sanjay Gupta (2011). "An empirical investigation of the effect of imputation credits on remittance of overseas dividends," Journal of Contemporary Accounting & Economics 7(1), June, pp. 18-30. Sanjay Gupta, Yuhchang Hwang and Andrew Schmidt (2011). "Structural change in the research and experimentation tax credit: Success or failure? " National Tax Journal 64(2), June, pp. 285-322. Mei Feng, Jeff Gramlich, Sanjay Gupta (2009). "Special Purpose Entities: Empirical Evidence on Determinants and Earnings Management," The Accounting Review 84(6), November, pp. 1833-1876. Sanjay Gupta, Jared Moore, Jeffrey Gramlich, Mary Ann Hofmann (2009). "Empirical evidence on the revenue effects of state corporate income tax policies," National Tax Journal 62(2), June, pp. 237-267. Sanjay Gupta and Lillian Mills (2003). "How Do Differences in State Corporate Income Tax Systems Affect Compliance Cost Burdens? " National Tax Journal 56(2), June, pp. 355-371. Sanjay Gupta and Charles Swenson (2003). "Rent-Seeking by Agents of the Firm," Journal of Law & Economics 46, pp. 253-268. Sanjay Gupta and Mary Ann Hofmann (2003). "The Effect of State Income Tax Apportionment and Tax Incentives on New Capital Expenditures," Journal of the American Taxation Association 25, Supplement, pp. 1-25. Charles Swenson, Sanjay Gupta, John Karayan & Joe Neff. (2003). State and Local Taxation: Principles and Planning. Boca Raton, FL: J. Ross Publications. Sanjay Gupta, Mary Ann Hofmann (2003). “The Effect of State Income Tax Apportionment and Tax Incentives on New Capital Expenditures,” The Journal of the American Taxation Association 25 (Supplement), 2003, pp. 1-25. Charles Christian, Sanjay Gupta, James Young (2002). “Evidence on Subsequent Filing from the State of Michigan’s Income Tax Amnesty,” National Tax Journal 55(4), December 2002, pp. 703-721. Sanjay Gupta, Lillian Mills (2002). “Corporate Multistate Tax Planning: Benefits of Multiple Jurisdictions,” Journal of Accounting and Economics 33(1), 2002, pp. 117-139. Peter J. Frischmann, Sanjay Gupta, Gary J. Weber (1998). "New Evidence on Participation in Individual Retirement Accounts (IRAs),” The Journal of the American Taxation Association 20(2), Fall 1998, pp. 57-82. Sanjay Gupta, Howard Shanker, “Taxing the Environment,” Tax Notes 74(11), 1997, pp. 1451-1458. Sanjay Gupta, Kaye Newberry (1997). “Determinants of the Variability in Corporate Effective Tax Rates: Evidence from Longitudinal Data,” Journal of Accounting and Public Policy 16(1), 1997, pp. 1-34. James Boatsman, Sanjay Gupta (1996). “Taxes and Corporate Charity: Empirical Evidence from Micro-Level Panel Data,” National Tax Journal 49(2), 1996, pp. 193-213. Steve Golen, Sanjay Gupta, Mike O'Dell (1996). “An Evaluation of Communication Barriers between Tax Practitioners and Their Clients,” Journal of Education for Business 71(3), 1996, pp. 157-161. Steve Golen, Sanjay Gupta, Mike O'Dell (1995). “Identifying Communication Barriers between Tax Practitioners and IRS Agents,” Journal of Business and Technical Communication 9(3), July 1995, pp. 321-40. Sanjay Gupta (1995). “Determinants of the Choice between Comprehensive and Partial Income Tax Allocation: The Case of Domestic International Sales Corporations,” The Accounting Review 70(3), June 1995, pp. 489-511. Charles Christian, Sanjay Gupta, Gary Weber, Eugene Willis (1994). “The Relation between the Use of Tax Preparers and Taxpayers’ Prepayment Position,” The Journal of the American Taxation Association 16(1), Spring 1994, pp. 17-40. Charles Christian, Sanjay Gupta, Suming Lin (1993). “Determinants of Tax Preparer Usage: A Panel Data Approach,” National Tax Journal 46(4), December 1993, pp. 487-503. Charles Christian, Sanjay Gupta (1993). “New Evidence on ‘Secondary Evasion’,” The Journal of the American Taxation Association 15(1), Spring 1993, pp. 72-93. Joann Martens-Weiner, Sanjay Gupta (2006). “Tax Compliance Costs for Companies – National Report from the United States”. In Tax Compliance Costs for Companies in an Enlarged European Community, Michael Lang, et al., editors, Wolters Kluwer International, Netherlands, 2006/2008. Sanjay Gupta, Kaye Newberry (1992). “Corporate Average Effective Tax Rates after the Tax Reform Act of 1986,” Tax Notes 55(5), 1992, pp. 689-702.